Inés is not a normal teacher who teaches in front of a class. Instead, she teaches students in a Buenos Aires hospital and in their homes if they have illnesses that make schoolgoing impractical. Inés has developed an innovative audiovisual communication project in which the students produce animated shorts and educational radio programs. Children and adolescents act out lessons, becoming proficient in multimedia production processes while developing their creative capacities and overcoming their isolation with the help of ICT. The students also disseminate information regarding the special care required for treating their conditions. In this way the student-patients become active participants in their own learning process, and their parents, doctors and the entire hospital community as well the Home School are involved as well. Each audiovisual work is then distributed via social networks, at meetings in the hospital, medical and educational congresses, workshops, festivals and book fairs, and several productions have won prizes. Inés has shared her approach with other teachers of hospital-based and home-based students across Argentina, making them aware of the value of using ICT in this context and training them in the technical steps of creating audiovisual productions. 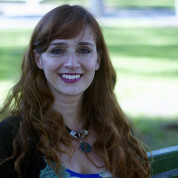 Join the #TeachersMatter movement by sharing Inés Bulacio’s update.